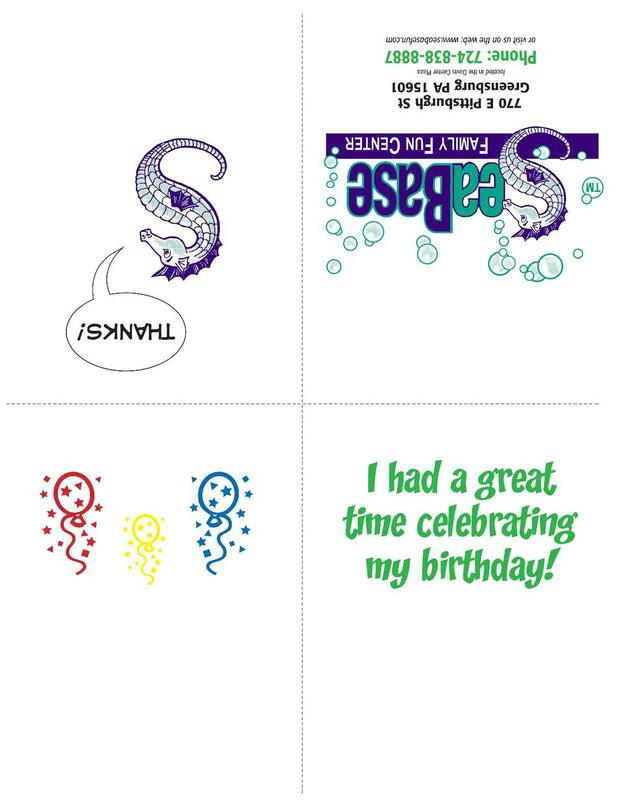 Here you can find anything and everything relating to parties at SeaBase. We know your child’s birthday is important to you, so please read this page carefully and give us a call when you're ready to schedule or click on the links below to book online. It's never too early to book (the earlier the better! ), but all parties must be booked at least one week in advance. Birthday parties at SeaBase start at $158.89 for up to 10 kids, plus one free birthday child. Children beyond 10 are $14.99 each. You will have use of one of five private rooms with seating for up to 20 for an hour and a half (you can stay to play as long as you want after that), a personal host/hostess, and a large pizza and pitcher of drinks for every 5 children in the party. Your guests are checked in for you so you can enjoy spending time in the party room, and each child will receive 10 arcade tokens and either a game of laser tag or a ride on the train. The birthday child will receive a voucher to redeem for prizes at the front counter. All paper products are included. NEW: The birthday child now also receives a free ticket for the Laser Maze! 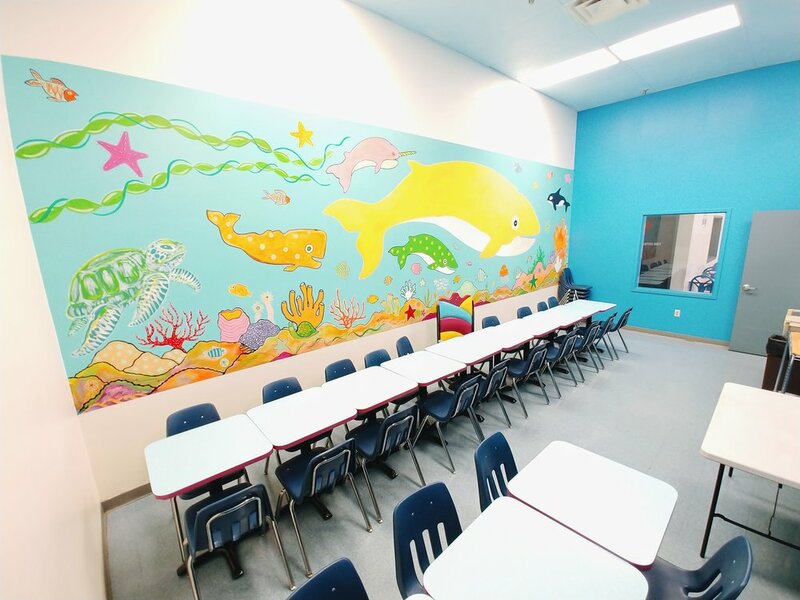 For larger parties, or if you would simply like to have extra space, we offer our Whale Room at $317.79 which covers for up to 20 kids, plus a free birthday child (still $14.99 per child beyond 20). 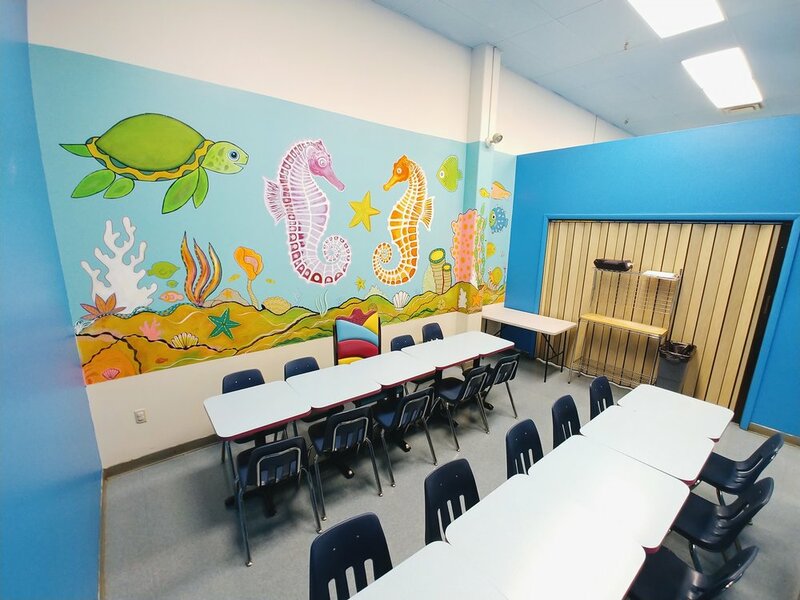 The Whale Room has space for approximately 40 kids if needed. A description of exactly how we run our parties is at the bottom of the page, as are printable invitations and thank you cards. View the attached flyer for itemized party information, including a wide range of food options for the adults at your party. Please note that prices, policies, and offerings reflected on said flyer may have changed since it was last printed and the most up-to-date party information is always written in the text portion of this page. Ready to book? Call 724-838-8887 or click below. 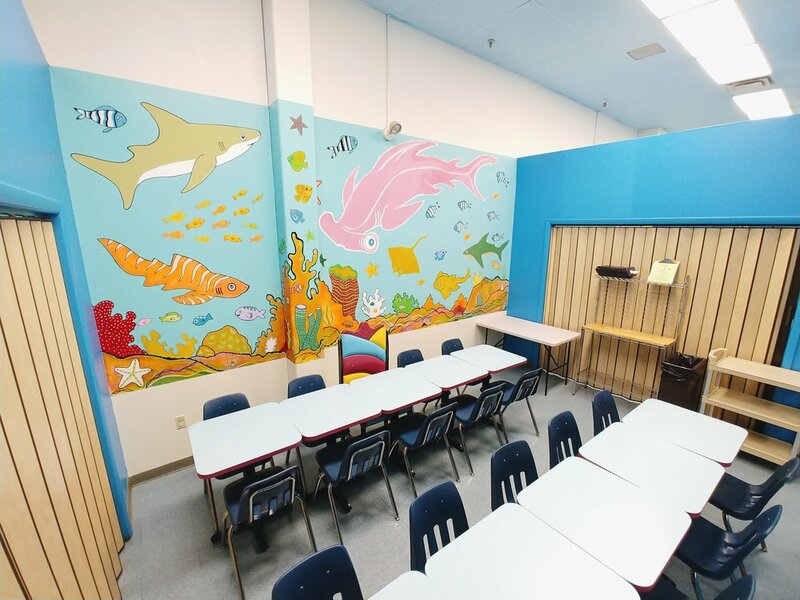 The initial $158.89 for 10 kids+1 (or $317.79 for 20+1 in the case of the Whale Room) is due immediately upon booking to reserve your room. Any kids beyond 10 (20 for the Whale Room) are paid for the day of the party at the party price of $14.99/child--no exceptions. Admit One Passes may not be used for extra party kids, nor may extra party kids be paid for at the regular admission price. SeaBase 3 Month/1 Year Passes do not cover party admissions. All of your own children are considered party admissions. It's never too early to book your party, but we encourage you to schedule at least 2-3 weeks in advance. Please note that as a rule, we do not schedule last-minute parties less than 7 days before the intended event date. See below for information about doing an informal, walk-in "galley party" if you've waited a bit too long to schedule a room and package. Additional time in your party room is only available by doubling time and doubling payment. For example, if you're having a party of 15 kids, expect to pay for two parties of 15 kids. No exceptions. 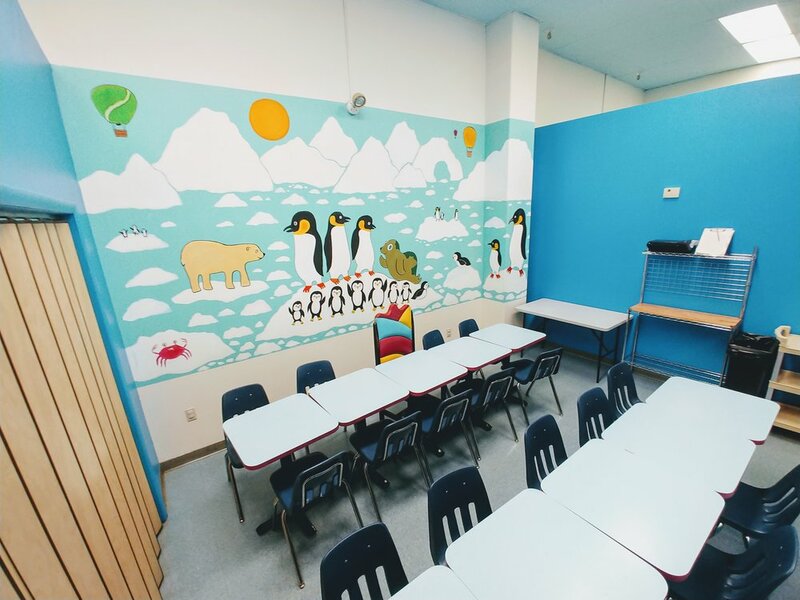 Booking rooms side-by-side for extra space is only permitted if you are genuinely expecting more kids than can fit in one room (the Whale Room can hold up to 40 if needed), or at least are prepared to pay as if you are having more than that. Please speak with a manager if there's any confusion on these points, and forgive the following brief sternness: If you think you’ve found some clever loophole to circumvent the above policies, you haven’t. We’ve heard it all before and you will be charged as described above. Parties less than a week away are encouraged to do an informal, walk-in "galley party" in the general seating area. This is also a great option for small family parties. If choosing this avenue, please understand that our priority is our regular, scheduled parties. We do not reserve tables for walk-ins and note that checking your guests in for you is a perk that we only extend to our scheduled parties. If you wish to pay for your guests, we ask that you or a member of your party stand near the entrance to pay as they arrive--that is, no prepayment for X number of guests, and no keeping tally to be paid at once later on. You may bring your own cake, but no other outside food or drinks permitted. In order to always be able to reliably produce the same great party for every visitor year after year, our party package, its pricing, format, and policies are not up for negotiation. Everything you've read on this page is what goes--no exceptions. 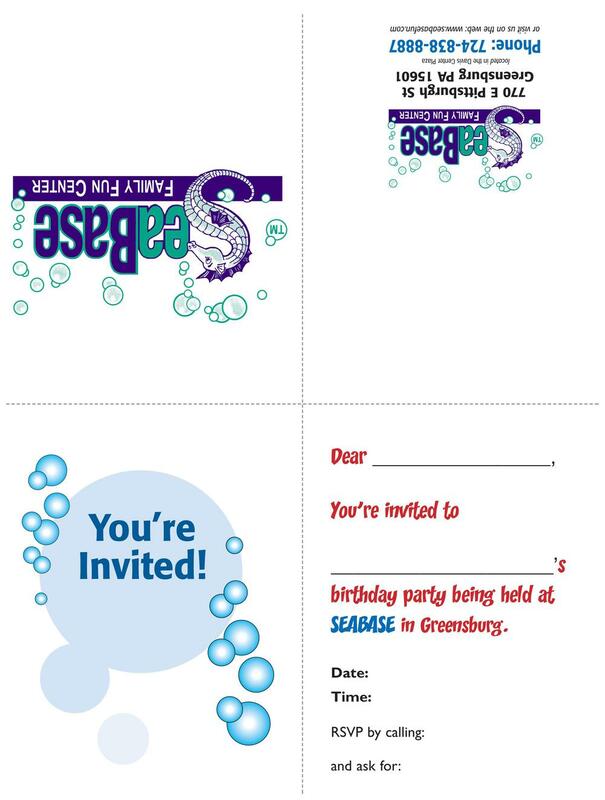 Click here or on the image below for a printable pdf of our party flyer. Ask your party host about adding Dippin' Dots to your party. Overnight parties are a great option if you're looking to do something unique for a special birthday, team gathering, or group outing. You will have private use of the building from 10pm-7am, including one hour of unlimited laser tag, one pizza and a pitcher of drinks for every 5 children, and 10 game tokens for each child. $450 for up to 15 kids; $18.99 each beyond 15. Call or stop in to schedule your overnight party. As the party parent, you should arrive at least 30 minutes prior to your start time, although the room itself will not be available until 10-15 minutes before the start. This is a good time to tell your guests to arrive. At check-in, your guests receive 10 tokens for the arcade and a wristband; parents are given a matching name tag, and they are directed back to your room. At or near your start time, the host/hostess serves the kids pizza and drinks, and then aids in cutting and distributing the cake. Optionally, you may unwrap gifts in the room (although for larger parties this might be better done at home or outside the room after the party in order to save time). Next, the kids are brought to the front as a group for their turn in either laser tag or on the train (they may decide for themselves which they would like to do). After this, they are off to play and the adults usually use remaining time in the room to chat while the kids play. Near the end of the hour and a half, you will be asked to come do a quick survey and pay for any additional food and guests beyond ten before the server cleans up the room. You and your guests may stay to play as long as you’d like in SeaBase, but the room must be cleared at the end of the party time slot. Please note that we must keep parties running on time and there is little wiggle room to delay the start. We prepare food to be ready at or very near the start time, so asking to delay the start for the odd guest running late may affect the quality and likely make the rest of your party feel rushed. This is especially important on busy weekends with multiple parties. 11:30 - You (the party parent) arrive. Guests arrive anytime after you and receive their tokens at check-in. Your time with the room doesn't begin until closer to 12:00 though. 11:45-11:55 - Your room will be open and ready for you to set up. 12:00 - Your party's start time. Food is served within the first 15 minutes, then cake, then gifts are opened if desired. Everything that you want to do with the kids in the room should be done first before sending them to go play, to ride the train, etc. 1:00(ish) - Usually by now all food and cake has been eaten, gifts have been opened, and the kids are anxious to play. Your host will bring all the kids to the front as a group for their turn in either the train or laser tag, then they're free to go play. Parents and other adults usually use this time to linger and chat in the party room. 1:20-1:35 - Your host will ask you to come to the front counter to check out for any extra kids or additional food items and to fill out a quick survey. This is the end of your party time in the room and the host needs to begin cleaning and setting up for the next party. You are welcome to stay to play in SeaBase as long as you'd like. In order to hold your room, the initial $158.89 (or $317.79 in the case of the Whale Room) is due immediately upon booking. We do not schedule last-minute parties less than a week in advance, so please do not delay in booking. Any kids beyond 10 (20 for the Whale Room) are paid for the day of the party at the party price of $14.99/child--no exceptions (that is, you may not pay regular admission for the kids beyond 10/20). No payment by check. Admit One Passes cannot be used toward extra party kids. All of your own children are considered party admissions--you may not pay regular admission for the honoree's brothers/sisters. One Year Pass-holders are still considered party admissions. If you need to cancel your party, you may do so for a full refund up to one week before your party. Once you're inside of 7 days before the party, no refunds. Absolutely no exceptions. This includes downgrading from the Whale Room to a smaller room. Rescheduling of parties is still permitted inside of 7 days up until the night before your event (after that it’s considered a no-show and you’re out of luck), but limited to a single reschedule. If the event cannot be held on that rescheduled date, a 50% refund will be made and the party canceled. Parties that were rescheduled inside of 7 days before the original event date are ineligible for full refunds. No outside food (except a cake) or drinks are permitted. Decorations in the room should be limited to those that can be put up and taken down in roughly 5 minutes. Please limit use of tape. The following are not allowed: confetti, glitter/items with glitter coating, piñatas, smash cakes, silly string, and any other messy items. With more than 20 years of experience running birthday parties, we know you and your kids will find having a party at SeaBase to be the easiest and most fun option available.